From the moment I first heard Beach Slang’s debut EP Who Would Ever Want Anything So Broken?, I knew that I’d found something special. This was the kind of band that spoke so straight to my heart that I felt an immediate and intense personal connection with not only their music but with them. They mixed the best elements of ’80s college rock, ’90s indie rock, and punk throughout the ages, creating a sound that was magical, powerful, and timeless. Oh and did I mention the lyrics? Those cathartic poetic moments that perfectly gave voice to the rage and heartache of the kids that never fit in and the adults that they became. This was my band. This single verse not only brilliantly sets the stage for the record to come, but it also sums up the essence of the band. From there the record twists and turns its way through stories singer/guitarist James Alex heard on the road from fans and used to paint powerfully poignant pictures with his words. Unlike previous releases, Loud Bash was written on the road and thus brought new perspectives to the table proving that not only can Alex write intensely personal lyrics based on his own experiences but on those of others as well. Sonically this record follows that brilliant Replacements meets Jesus & Mary Chain meets Jawbreaker vibe of the band’s previous efforts (only with a little less of the fuzzy guitar action). In a lot of ways, Loud Bash is the logical sequel toWho Would Ever, in that it is more straight forward and less distorted and the lyrics touch closer to the same vein as battle cries for the dejected, overlooked, underappreciated, and oft forgotten misfits and outcasts. The record closes out with a song about surviving the darkness of thoughts of suicide, but does so in classic Beach Slang fashion by taking a depressing subject and turning into an anthem for life. From start to finish A Loud Bash of Teenage Feelings is a spectacular record from a band that can truly do no wrong. In three short years, Beach Slang has become one of the most important bands in rock ‘n’ roll. The band’s music (and its members) is earnest, brutally honest, self aware, and humble, creating an atmosphere that is welcoming and nurturing to all those who have ever felt unwanted, slighted, left out, or unloved. This sound, these records, this band is something truly special and timeless. You know an artist’s music and story has connected with you when you find yourself brought to tears from reading an interview with the band. 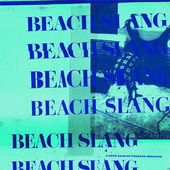 So Beach Slang, I’m in. Whatever you guys do, wherever you go, I’m all in. Originally posted on Oklahoma Lefty. This entry was posted in music, music reviews and tagged A Loud Bash of Teenage Feelings, Album Reviews, Beach Slang, Oklahoma Lefty. Bookmark the permalink.